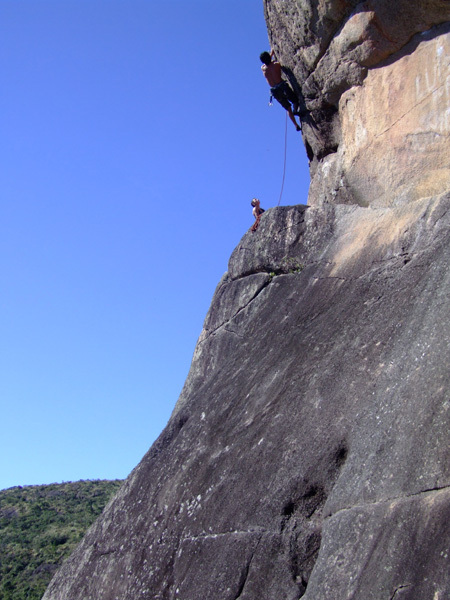 Brazil is probably the country in South America with the best and most developed rock climbing scene. The most famous areas include the whole of urban Rio de Janeiro, Pedra Rascada, Salinas (aka. 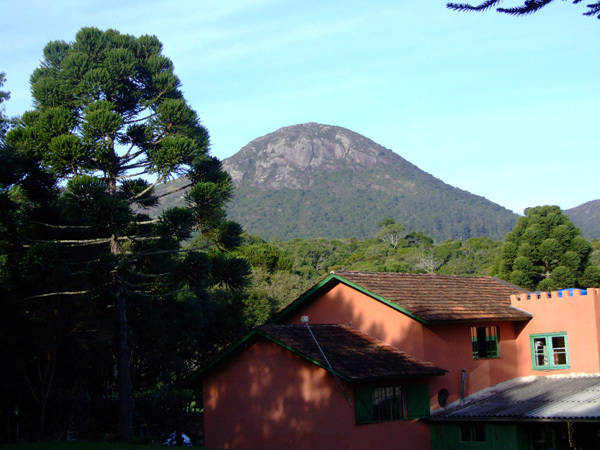 Tres Picos), Itatiaia, Pedra do Bau and Marumbi. 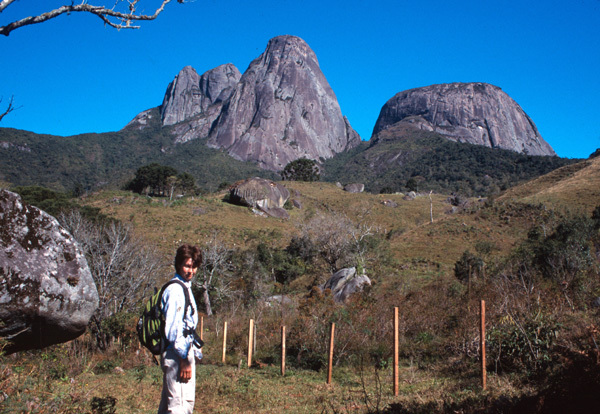 The rock in Brazil's coastal mountains is almost exclusively granite, often very rough grained. Some sandstone and limestone crags exist elsewhere in the country. Guidebooks exist for most of these areas. 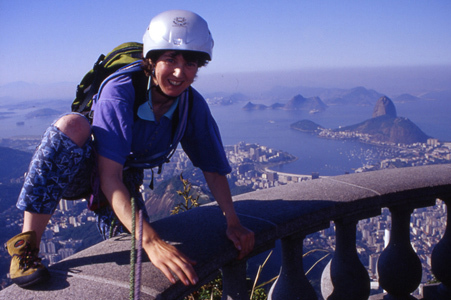 ANDES lead and organise rock climbing trips to Brazil - for details please see the Brazilian Climber and Scrambler page. On the route ' Infravermelho' on the Morra Urca, above the Praia Vermelha, Rio. 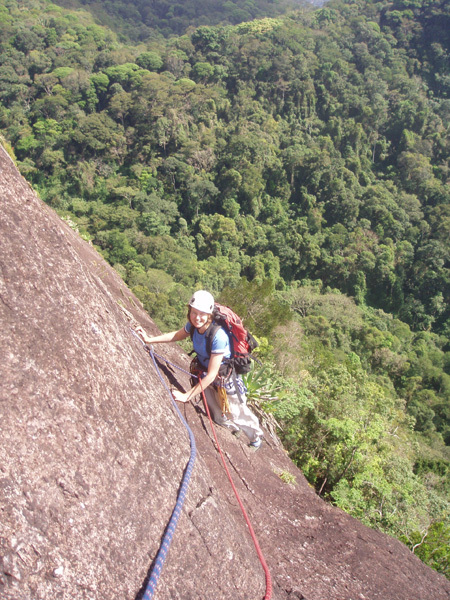 Climbing on the north side of the Agulinha da Gavea, Floresta da Tijuca Rio. In the Brazilian winter climbing season the north side is of course the sunny side.! Topping out on K2, Grade IV+ (about E1 or 5.8) which finishes right by the Cristo Redentor statue on the Corcovado. Watch out for the Japanese tourists. Some of the longest and most impressive routes in Brazil are found on these mountains a few hours drive northeast of Rio. It is a very scenic area. Pico Maior, at 2315m, is the highest peak around here. It's in the middle of the photo below. 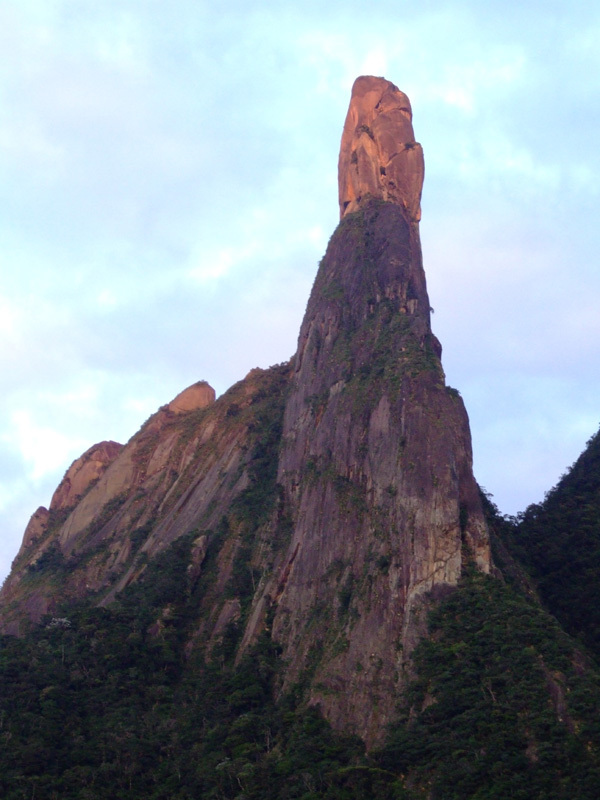 The Dedo do Deus at sunrise. Some of the highest peaks in the coastal range are in this national park. there is excellent scrambling and some good rock climbing too. Be prepared for cold weather in the June-August Brazilian climbing season. Frosts are regular at night and it even occasionally snows. 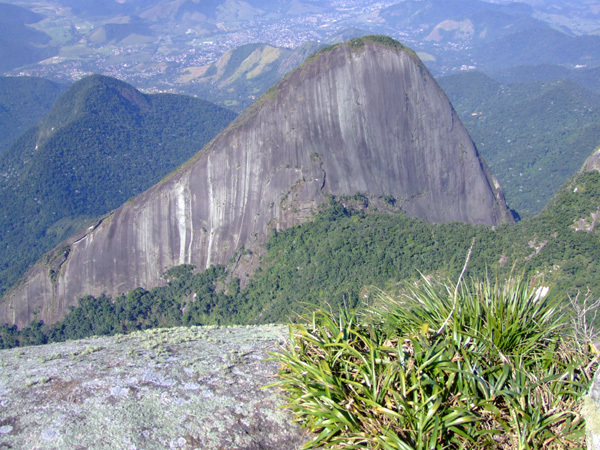 The Pedra do Bau is the biggest peak here - bigger than it looks at nearly 300m! 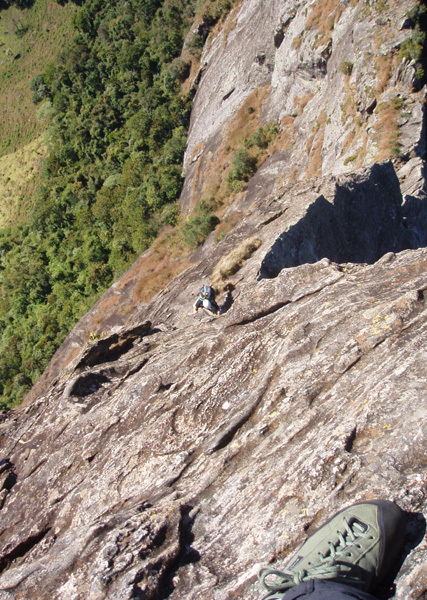 Looking down the easy but exposed top pitch of the Normal route on the Pedra da Bau (grade III). Located just a short way from the city of Curitiba in Parana state, Anhangava is a small friendly place to climb, on very good rock. There aren't many routes though and nothing is longer than about 20m. However if you are in the area it is worth checking out. Pictured below one of the steeper routes at grade VII, the lower slab is a delicate grade V (about E1). The nearby Refugio 5.13 (Cinco Trece) is a cool place to stay, they sell guidebooks, have information and a nice campsite surrounded by Parana pines. Marumbi is a steep and wildly overgrown and very atmospheric place to climb. It is about halfway between the city of Curitiba and the Atlantic Ocean. 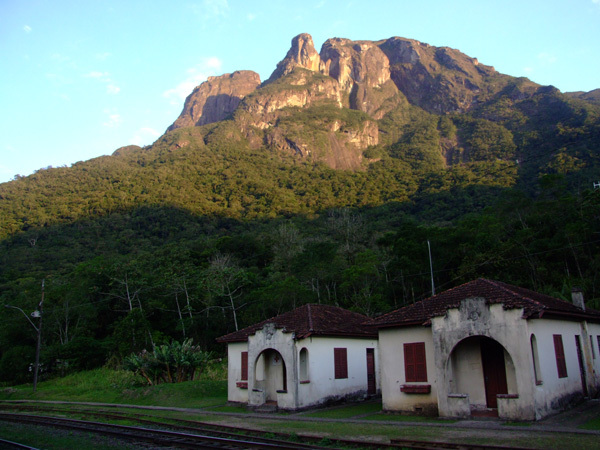 To get here either take the tourist train from Curitiba to Marumbi station (pictured below), or follow the old colonial road of the Estrada da Graciosa to the park entrance, from where a one hour walk gets you to the station. The following guidebooks are all reasonably easy to find (once you get to South America!!) and are reasonably accurate and useful. Guia de Escaladas - Urca (Portuguese) by Flavio Deflon and Delson Queiroz -- the classic climbing areas around the Sugar Loaf - Morro da Babilonia, Morro da Urca and the Pao de Acucar itself. Floresta Da Tijuca (Portuguese) by Flavio Deflon and Delson Queiroz -- climbs in some of the more outlying areas of Rio, including the Pedra do Gavea, Agulinha da Gavea, Corcovado and the Pico Tijuca. Guaratiba - Andre Ilha -- A coastal area near Rio. Guia de Escaladas do Itatiaia (Portuguese) by Alberto and Correa Guedes -- Climbs in this mountainous area about four hours drive from Rio, including Agulhas Negras and Prateleiras. Guia de Escaladas - Tres Picos (Portuguese) by Alexandre Portela and Sergio Tartari and Isabella de Paoli. 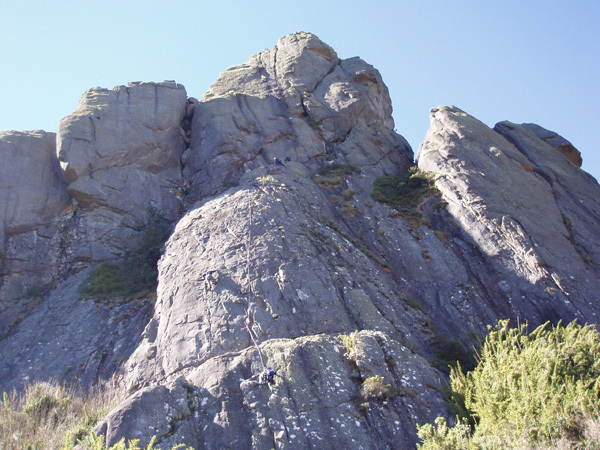 Manual de Escaladas e Boulders - Pedra do Baú (Portuguese) by Eliseu Frechou -- A small guide to this brilliant piece of rock. Anhangava (Portuguese) by Dalio Zipppin Neto and Ronaldo Franzen. Marumbi (Portuguese) by Jose Luiz Hartmann.